In keeping with bird of doom’s ethos of reintroducing both fear and contemplation into the world of flight, Ciaran Begley has produced and reproduced a series of images and noise that meditates on flying in the modern world. Since flying was conceived for humanity, it has inevitably been linked with descent. This association and its function as a metaphor for unchecked ambition, endures at a time when flight is not only a possibility but an industry. 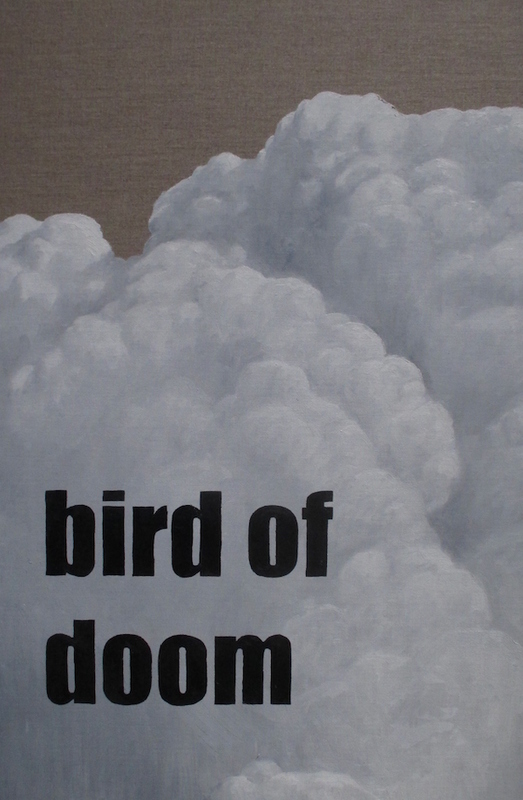 At bird of doom we embrace this concept as enriching the experience of our daily lives both on and off the ground. In this exhibition Ciaran Begley develops previous themes of commercial aircraft design, flight safety reinterpretation, actual aircraft parts and the wonder of flying. This show of simple paintings of clouds, violence, text and noise is part of an ongoing series of works exploring this theme.